So first, the good news. After I wrote a blog post yesterday calling out the City of Fresno for its daily watering of Augusta Street alongside Cary Park, a wide range of friends and strangers on Facebook, Twitter, and in local media responded by sharing, retweeting, and engaging with the story. This morning, as I made my morning walk, the sprinklers were off for the first time this week and the city’s overwatering of Cary Park was paused–for now. As my new video above shows, there’s still a busted City of Fresno sprinkler head on the SE corner of Cary Park, where the water has been leaking into the street 24/7 for at least four days. The broken sprinkler head is on the edge of the park where people with cars–including city vehicles–often drive over the curb and onto the park’s grass. Local journalist Mariana Jacob and a news crew from ABC30 captured the quiet gusher in action yesterday as well, as part of their story on the challenges of water wasting that both the city and others are facing. It aired last night on ABC30’s 11 o’clock news. The homeless? Really, Mr. Mozier? Yes, the city’s public relations strategy for owning up to its own water wasting and lack of oversight and prompt fixes to public parks seems to be to blame the homeless, some of the most vulnerable people in our city, a group that our mayor and city manager saw fit to flush from downtown in a series of removals the past two years. A friend of mine on Facebook yesterday commented that he’d heard from neighbors near Einstein Park that sometimes the city would run the sprinklers in that park all night in order to keep the homeless from sleeping there. I thought that might have just been a rumor, but perhaps giving the city the benefit of the doubt on having such a strategy would be too kind. First: Dear city, please come and fix this gushing sprinkler head in Cary Park. Mr. Mozier told ABC30 that when fixes are reported, “We will be jumping on that. If there’s a repair that needs to be made, we’ll make it happen.” How about today? Second: Dear city, own your mistakes and stop blaming others. 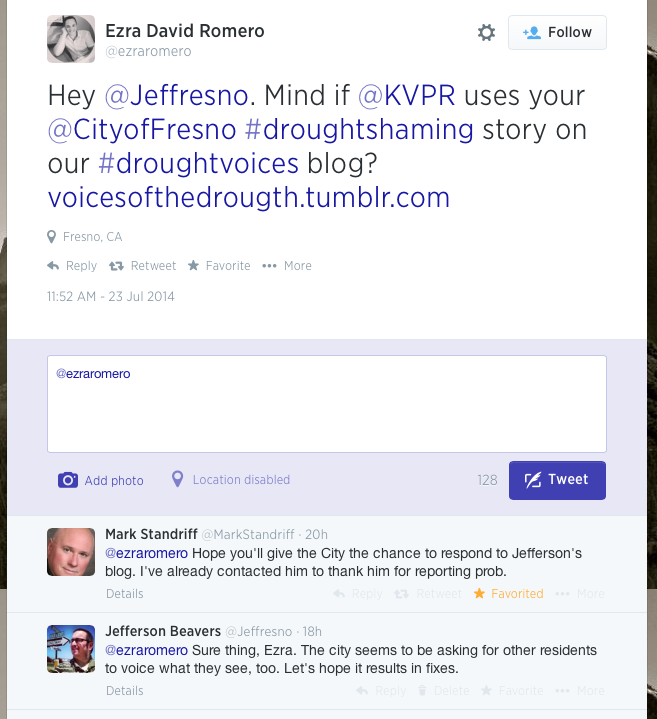 If the city’s high-paid communications director, Mark Standriff, is asking local journalists (like VPR’s Ezra Romero, in the above photo’s Twitter exchange) to give the city a chance to have its voice heard, it better be ready to point the finger at itself when necessary. Finally, as the city prepares to move us to “Stage 2” watering restrictions on Aug. 1, which will include fines for violators who run water unchecked into the street, I ask this question: Is the city prepared to fine itself the state-mandated $500 per day for mistakes like this broken sprinkler head in Cary Park, as it seems poised to fine residents? The city says to call 559 621-5300 to report problems you see with the city’s water wasting in parks and medians. I say, take them up on it. The City should accept responsibility for breaking the sprinkler head? Huh? Did they break it? Sounds like they’re going to fix it though. What he did speak to, and perhaps didn’t phrase well, is the vandalism problem. Doesn’t matter if the criminal is homeless or not, theft is a huge problem in our local parks. I’ve spoken to city maintenance workers, these vandals will take anything and everything; from brass fittings in the sprinkler system to fencing… yes, they’ll wrap up yards of fencing and just carry it off. These maintenance guys are good, hard working people who care about our parks like everyone else, but there’s not enough of them. Due to short staffing, these departments are forced to be reactionary instead of proactive in addressing repairs and maintenance. Left off my last point… I think that brings us back to the issue at hand, the City needs our help with identifying problems in our parks. Thanks, Bryan. You’re right of course, and you make important clarifications. And I know you understand this issue personally, due to the recent vandalism of the small park adjacent to CMAC. But I don’t understand the blame game. Meanwhile, the water continues to flow. A city crew was out in the park this morning, mowing and edging and leafblowing and spraying. Three different guys walked past the broken sprinkler head multiple times. They had to have seen it. I watched them from my home office window. Yes, I’m sure that the staff on the ground are hardworking and are good people. But still not fixed. Yeah, I guess I didn’t see so much as blame, rather just an explanation for why we’re seeing some of these problems in our parks. Obviously not all of the problems arise from vandalism, case in point the sprinklers coming on for hours every single day or cars driving over sprinkler heads. The guys that mow, edge and leafblow, likely aren’t the guys that repair the sprinkler system. At least that’s my guess. But I do hope they get out there and fix it soon! The City definitely should be held accountable for the new watering standards that are about to be enforced. Regarding the issue of accountability, if you’ve followed any of the news reporting or on social media, you’ve seen the City’s repeated requests for citizens to let us know when they see City water problems (broken sprinklers, water gushing into the street or flooding a park, etc.) The City needs to lead by example, and because our staff can only see so much, it’s vital for the public to contact us directly so we can fix it in a timely manner. Finally, I want to clear up some misconceptions regarding the State Water Resources Control Board announcement and how it affects the City of Fresno. The state board didn’t mandate fines – they proposed fining repeat offenders UP TO a maximum of $500. That doesn’t apply to the City of Fresno because we’re already complying with most of the SWRCB’s regulations. We have been since 1994. We’ve had a system of citations in place for 20 years, which allows for warnings and then subsequent fines of $45. And yes, since the City of Fresno is also a water customer, we are just as accountable as anyone. However, we don’t want to cite people when we can help them solve their watering problems. That’s why we have 10 water conservation representatives on hand and available 7 days a week to help our customers find solutions. The bottom line is that we all have to work together to save water. Please let me know if you have any other questions or concerns. I appreciate your additional thoughts and clarifications, Mark. Also: Still waiting on the sprinkler head repair at the SE corner of Cary Park. Water continues to flow quietly and steadily into the street. There were two homeless individuals camping around my neighborhood who (witnessed by a neighbor) have stolen all of my brass top sprinkler heads as well as those of my neighbors in my neighborhood. Did I call a tv crew – please…have some responsibility. I changed out my sprinkler heads to plastic. What would it take for you to show a little respect and responsibility for the park next to you…be glad you have a park. Thanks for your comments, Gladys. For the record, I did not call the ABC30 crew; they contacted me and decided to come on their own. Also, I am definitely glad that I live next to Cary Park. Through my posts this week, I AM taking greater responsibility for my neighborhood by respectfully, directly, and publicly questioning the city about its own water use (and misuse). So far, they have responded to the complex situation as best they can, and they still have much room for improvement–as we all do.